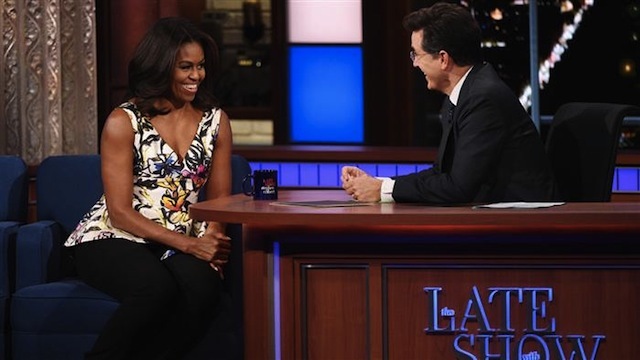 Michelle Obama stopped by The Late Show With Stephen Colbert and hilariously expressed what she’s looking forward to the most when she and the first family vacate the White House in a year. It looks like the first lady plans on continuing her mission to ensure that young girls get the opportunity to enjoy the benefits of a well-rounded education. She is also psyched about the prospect that she will finally be able to indulge in an activity that we all take for granted until we find ourselves married to the most powerful leader in the universe. Riding in a car with the windows down and the wind blowing in our faces is a basic activity for regular folks but for the president’s better half, it’s not an accessible disposition. Yikes! The life of a first lady is certainly not an easy one – neither is the realization that the administration that single-handily restored the glory of a once battered nation will be bidding adieu in the near future. Till that sad day arrives – we hope there will be more open car windows in Michelle Obama’s future.